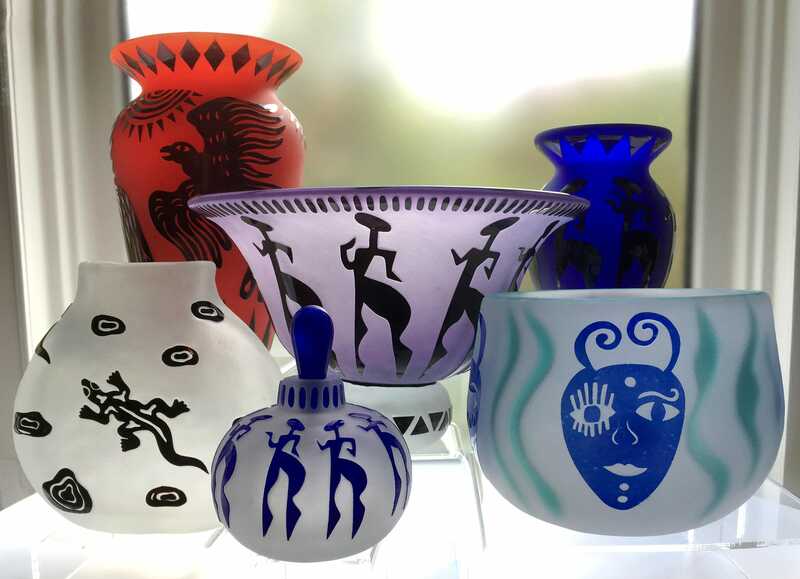 Stephen Fellerman and Clair Raabe are renowned glass artists who worked together during the 1990’s to create one-of-a-kind pieces of modern cameo glass. 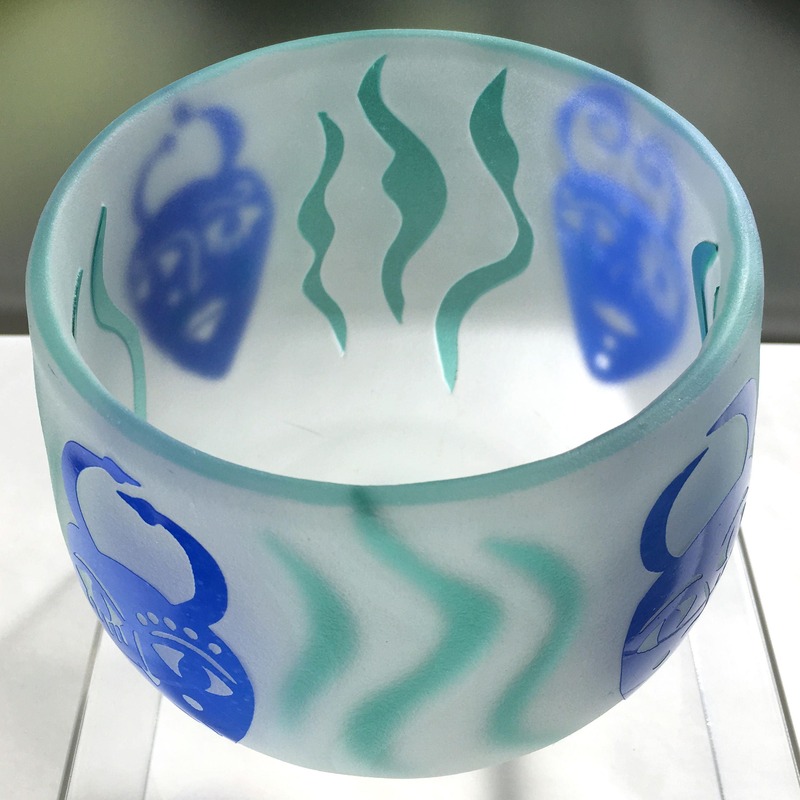 Raabe used a combination of old-world glass techniques and current diamond technology to hand-carve bold images into Fellerman’s colored, multi-layered, blown glass. Together, these masters of their crafts created art glass of great beauty. 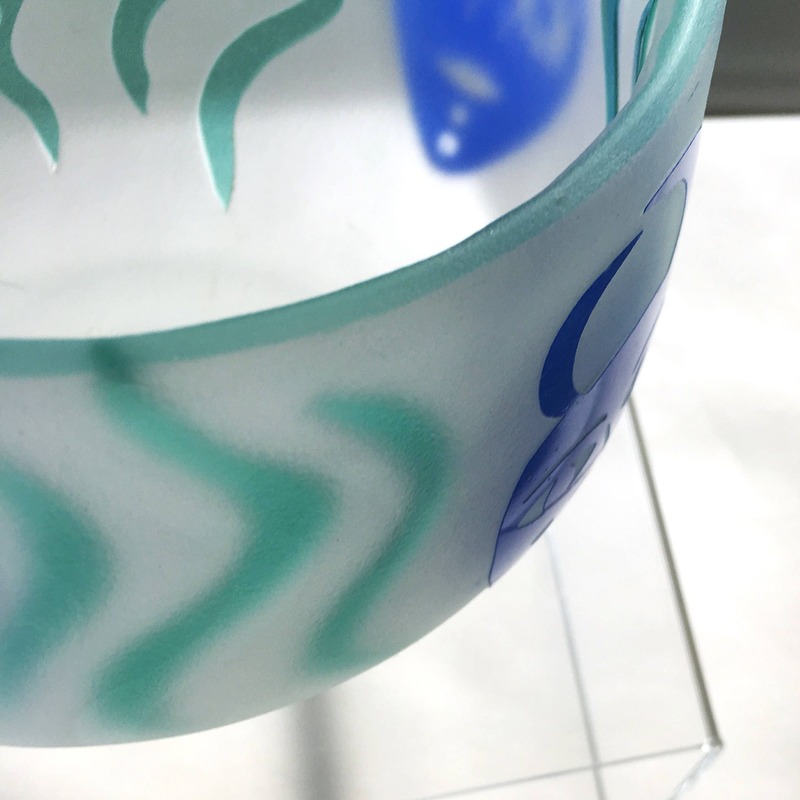 The innovative, sublime glass art from Fellerman and Raabe is a true collaboration of individuals who shared a vision and brought it to life in the brilliant medium of glass. Since each has moved on to new projects, these pieces are expected to appreciate in value as they become more difficult to find. This beautiful bowl is 5 inches in diameter and stands 4 inches high. 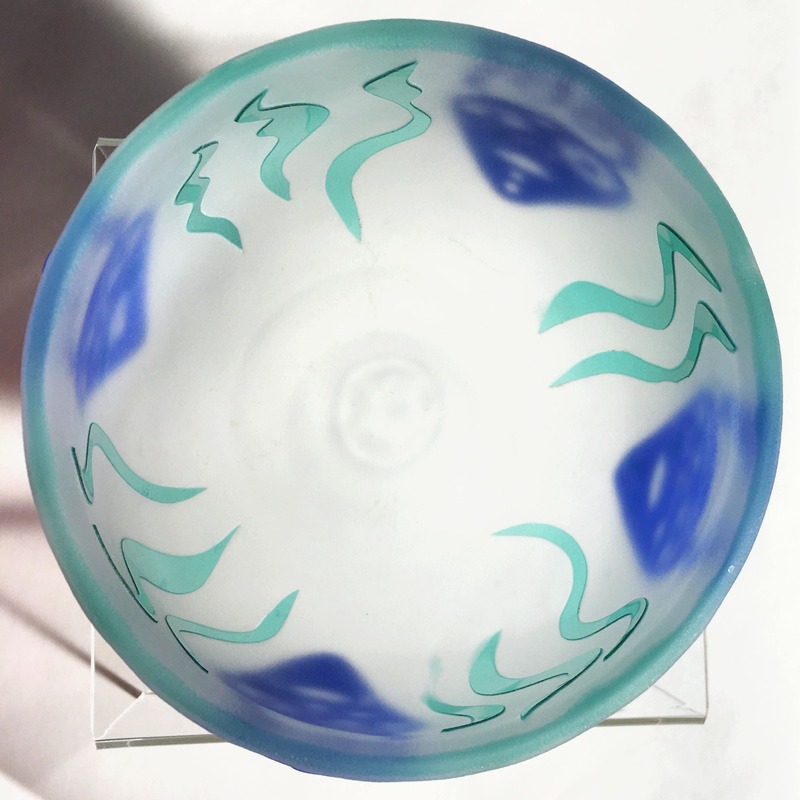 For this piece, Stephen Fellerman blew the glass in three layers: green inside, clear in the middle, and blue outside. The inside was carved away to create the green wavy lines, and the outside was carved to create the whimsical blue masks. Clair Raabe did twice the typical work on this one - half of it working inside the bowl! I see no damage to the piece - it is in excellent condition. Unfortunately, the white etched signatures on the white etched glass make the date impossible for me to read. 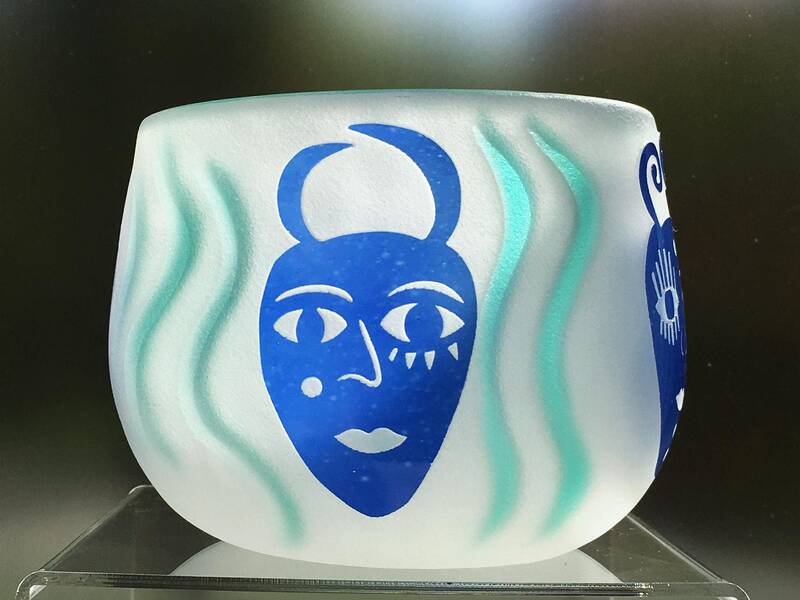 Please see my shop for other Fellerman/Raabe art glass, as shown in the photos.